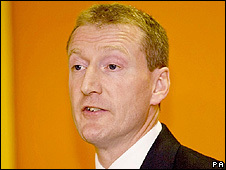 Scottish Lib Dem leader Tavish Scott has distanced himself from calls by one of his party's prospective MPs to back a Scottish independence referendum. Kevin Lang, who is contesting the Edinburgh North and Leith seat at the next election, said it could settle an issue which was "haunting" politics. His call came at the Liberal Democrat conference in Bournemouth. Mr Scott did not comment directly on Mr Lang, but said young candidates were keen to engage media interest. The Liberal Democrats, along with Labour and the Conservatives, are currently refusing to support the minority Scottish government's legislation to stage the referendum next year. Mr Lang, who is bidding to take the Edinburgh North seat from Labour at the next Westminster election, suggested allowing a referendum to take place would "settle an issue which I fear is haunting Scottish politics". Laughing off the issue, Mr Scott told BBC Scotland's Politics Show: "I remember what it's like to be a young, thrusting, energetic parliamentary candidate and you were desperate to get your face on the television. Mr Scott went on: "I can well understand the need to say something which commentators and television reporters are very, very, keen to talk about, but I don't really think the people are." Earlier, in his speech to the conference, Mr Scott claimed the SNP had spent £950m on "distorted" policies which gave more to the rich than the poor. He said: "If you have two children and earn £100,000 then you will have gained £802 per year from the SNP - but if you have two children and you earn £15,000 then you will have gained just six pounds and seven pence." "That's enough champagne and lobster every night for the rich, but a fish supper for the poor."